This is one of the finer swords in the Museum's collection. It may have originally come from the armoury of the Electors of Bavaria. The chiselling of the hilt is exceptionally fine and is based on designs by the French engraver Etienne Delaune. Swords were not just weapons but important decorative elements in masculine costume. They were symbols of honour and rank for their owners throughout Europe. The most common sword worn by gentlemen with their civilian dress from the middle of the 16th century onwards was the rapier. From 1560 it was applied almost exclusively to a fencing sword for civilian use. It was usual for rapiers to be accompanied by matching daggers. The rapier was a thrusting and slashing weapon with a slender light blade, while the dagger was more robust, used primarily for parrying and for thrusting in close. Rapier scabbards were suspended from a belt in a form of sling while the dagger was generally worn in a sheath on the left hip. 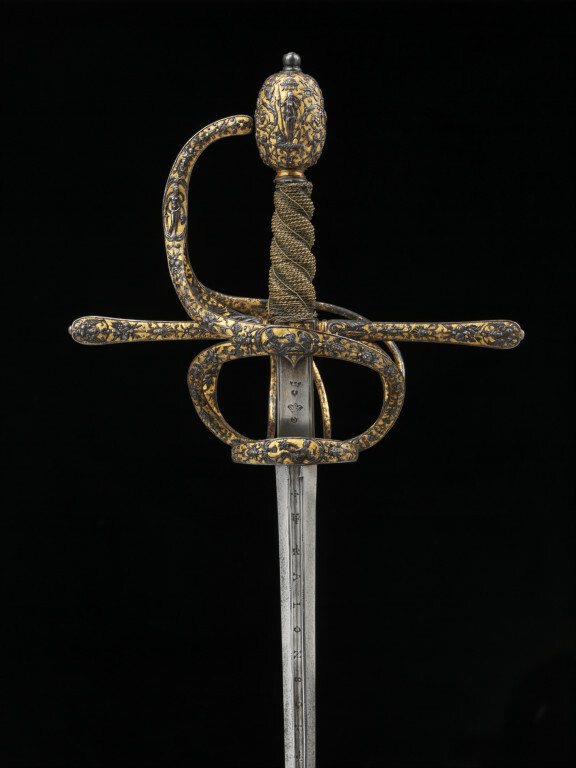 The classic rapier of the period 1570-1630 had a ‘swept’ hilt like this one. This was made up of interlinked bars and rings in front of and behind the guard sweeping in an elegant curve from the rear of the hilt to the knuckle guard. It afforded much more protection for the hand than the older straight quillons but was still not immune from the thrust of a thin rapier blade. 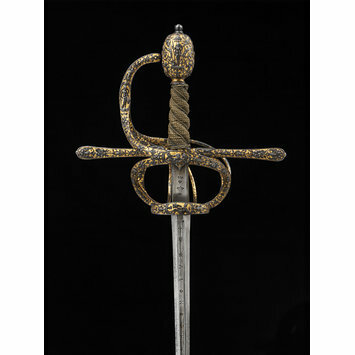 Historical significance: This is one of the finer swords in the Museum's collection. It may have originally come from the wardrobe of the Electors of Bavaria as the Sadelers worked at the Court there. The blade is a fine Toledo blade by the prestigious maker Alonso Perez. Perez worked at the shop of the famous swordmaker, Gil de Almau who produced several swords for the Emperor Charles V and his son Philip II of Spain, several of which survive in the Real Armeria in Madrid. Swords were not just weapons but important decorative elements in masculine costume. They were symbols of honour and rank for their owners throughout Europe. They remained an indispensible feature of outdoor dress of any person with pretensions to status until the late 18th century in Europe. The most common sword worn by gentlemen with their civilian dress from the middle of the 16th century onwards was the rapier. From 1560 it was applied almost exclusively to a fencing sword for civilian use. It was usual for rapiers to be accompanied by matching daggers. The rapier was a thrusting and slashing weapon with a slender light blade, while the dagger was more robust, used primarily for parrying and for thrusting in close. Rapier scabbards were suspended from a belt in a form of sling while the dagger was generally worn in a sheath on the left hip. The classic rapier of the period 1570-1630 had a ‘swept’ hilt. This was made up of interlinked bars and rings in front of and behind the guard sweeping in an elegant curve from the rear of the hilt to the knuckle guard. It afforded much more protection for the hand than the older straight quillons but was still not immune from the thrust of a thin rapier blade. Sword hilts became more and more elaborate after the introduction of firearms. Prior to that swords were used against armour primarily as cutting and thrusting weapons while the hand was protected by a gauntlet or by chain mail. Improvements to firearms made much armour redundant and so freedom of movement became more of a priority, particularly as swords became more part of civilian dress. Civilians were unlikely to wear hand protection in the way a soldier would and a forward thrust would expose the hand to danger. Hilts became more elaborate as a result. Fencing as a training activity became increasingly codified and a standard part of male education. The most expensive hilts received the richest ornament that could be applied without impairing the sword’s function. Sword blades were articles of international trade, made in a few important centres and shipped all over Europe where they were fitted with hilts in the local fashion. During the 16th and 17th centuries the sword blades of Toledo, Valencia and Milan were the most sought after but the largest centre of production was the German town of Solingen. The finest hilts were usually equipped with a Spanish blade but if not available a German blade (sometimes with a spurious Spanish inscription) was fitted instead. The most prosperous swordmakers in Toledo were concentrated in an area bordered by a road called Calle de Armas (Weapon Street) where there were also ironsmiths, crossbow makers, knife and axe makers. Guild regulations in Toledo were strict. Those seeking to practise as swordmakers had to pass strict tests of quality stipulated by the King. The King also protected the Spanish trade by issuing a decree in 1567: "…do not allow or permit to import any kind of sword in our kingdom from the exterior, and the ones made in Toledo wear the mark and signal of the master who made it and manufactured it, and the place where they are made, and whoever violates this they will be condemned as false…".